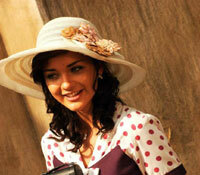 Today, British model Amy Jackson lands in Chennai. And though she has made several trips to the city before, this one will be special, as the actress is moving to India permanently. And why not. After all, the model turned actress from Liverpool got her first big break in the Tamil film industry. Spotted byA� director A L Vijay on the Miss Teen World website, she went on to star in his 2009 hit Madrasapattinam alongside Arya. Despite being new to the language, Jackson wooed audiences with her screen presence and landed her second film, Ekk Deewana Tha by acclaimed director Gautham Menon. Four movies later, Jackson found herself working with another famous director, Shankar, and is currently awaiting the release of I, in which she shares the screen with Vikram. Jackson has been working on I for the past two-and-a-half years and considers it to be a milestone. She plays the role of Diya in the romantic thriller and has been counting the days for the filma��s release. a�?Obviously there are very high expectations surrounding the film. Ita��s a huge part of not only my career, but my life,a�? she says. Since the release of the movie trailer on December 18, it has received more than 5,421,346 views on YouTube and is trending on Facebook, too. The music by A R Rahman is already a hit among fans and is receiving copious airplay on radio channels as well. Incidentally, Rahman also composed for Ekk Deewana Tha. a�?I was lucky to have had beautiful music composed by A R Rahman in Ekk Deewana Tha and for it to happen a second time for I is incredible. I love the entire album, but my favourite has got to be Ladio,a�? she says. Ladio also happens to be the first song in whichA� Jackson will be seen dancing from start to finish. a�?I loved performing it. Choreographer Bosco and his team are the best,a�? shares the star, who also danced to many of the songs during the audio launch of the movie that saw superstars Rajinikanth and Arnold Schwarzenegger as guests. a�?Performing for Rajinikanth and Arnie a��not to mention over 10,000 people behind thema��was overwhelming. It was my first on stage performance and I dona��t know how Ia��ll even begin to top that in the future,a�? she shares. Jackson, who feels that Indian men are a�?truly tall, dark and handsomea�? (she dated her Ekk Deewana Tha co-star Prateik Babbar) is a fan of Vikram. a�?He needed to arrive three hours before filming commenced for prosthetics and had to stay behind for hours each day to have it all removed. I can safely say that Vikram is one of the most hardworking and dedicated actors in the industry. He is like a chameleon with each film he does and he inspires me,a�? shares the actress who is impressed with the efforts that have gone into promoting I. a�?The marketing of the movie is very aggressive. PR is very important and to constantly update on social media is necessary too.a�? With more than two lakh followers on her Twitter handle, Jackson is comfortably social media savvy. a�?In this day and age, I feel social media opens the gateway to everyone. It gives sense to your ideology and personality,a�? she says. From playing a governora��s daughter in Madrasapattinam, Jackson has come a long way in the industry. a�?I was 17 when I did that movie and have spent five years in the industry now. My priorities have changed, I know what I should be doing and I have to learn to master my art,a�? she confides. After I, Jackson will be seen in director Thirukumarana��s next with actor Udaynidhi Stalin and a film with Dhanush, directed by Velraj. a�?I am open to doing different rolesa��say a rustic village belle. Thirukumarana��s film shooting has begun in Ooty and I play a very South Indian girl,a�? says Jackson, who dismisses rumours of playing a ghost in Venkat Prabhua��s Suriya starrer, Masss. That said, Jackson insists that she will be particular about choosing her roles, especially after I. a�?I dona��t want to backtrack. I want to make sure I have a strong character in the movie before I take it up,a�? she says. And being an avid traveller, Jackson doesna��t mind the hectic schedules. a�?I remember when we went to the mountains in China and had to walk for two hours to eventually reach our shooting spot. The location was definitely worth it though,a�? she recalls her 50-day shoot in China for I. a�?One day it would be 30 degrees then wea��d fly to another part of China and it was -5 degrees with snow, hail and everything else the sky had to offer!a�? she laughs. Aside from I, Jackson has been busy celebrating Christmas with her family in London. The 22-year-old has also been busy shooting for a gritty BBC drama series for a few months now. After romance-heavy movies like Ekk Deewna Tha and Yevadu, Jackson looks forward to working in an action flick. a�?I love action and have trained in kick boxing. Ia��ve been very sporty from childhood and would love to be offered an action-packed movie. I continue my classes in kick boxing even today,a�? she confesses. The actress also likes a challenge and has done a few bold photo shoots with magazines like Maxim. But is she open to playing a seductress? a�?It depends on the film. If I can do justice to the character, then why not? I like strong woman characters,a�? smiles the actress, who rates watching herself on the big screen for the first time, as the best moment in her life. ?A� Sari lover: Sari is the most beautiful attire a woman can wear. It is sensuous without showing anything. ?A� Top fashion tips for 2015: The spring summer collection that was showcased in December had a lot of pink and that is my favourite colour. An insider: I love India, which is why Ia��m shifting base here. I feel like it is home and Ia��m welcomed in the industry and I am part of it. Ia��m not an outsider anymore. Friendsa�� circle: I wish I could make more friends. I spent Christmas at home with family and met my school friends. When I am here, it is always just work. Newcomers: I always get good vibes from directors in India and I speak to everybody. This switch is going to be good and, though I have worked with Shankar, I am still a very approachable person and am open to trying new things and experimenting. Thata��s what acting is about. Best film of 2014: Dhanusha��s VIP, which was one of the highest grossing films of 2014. I am very happy that I am collaborating with Dhanush and Velraj. Under the scanner: Criticism is part and parcel of being an actress. Wish list: The list is way too long. Besides Shankar, I would love to work with Mani Ratnam. to travel and walk around there. Explored India: I have shot a lot in Chennai and have spent a lot of time here, too. In the city, I like hanging out in Amethyst, I like the food there. I have been to Kerala and Madurai, too. being stuck in the gym. Diet regime: I think everything in moderation is good. I have two juices every daya��ABC, which is apple beetroot and carrot, and one with greens like cucumber, spinach and celery. Your perception of India: I had read about India in Shantaram a couple of years ago and since then wanted to visit India. I like the hustle and bustle here. Football fan: I am a big fan of Liverpool, obviously. My favourite player is Steven Gerrard, of course. My father plays football, he even tried teaching me. A Sunday in the UK: It is very chilly here. Sunday is family and college friendsa�� time. I like walking the dog, chilling at the park, but it is very cold. Tune in: Ofcourse, I is on repeat. But I am always listening to House music, thata��s my favourite kind of music. Currently, I am listening to the songs by Michael Buble and his Christmas Album. Travel diaries: I love South Africa. A safari there is awesome. Pet peeves: I have two dogs, two horses and a cat. Ia��m a huge animal lover. I am already part of Peta and Ia��m an angel for animals. I have a Chihuahua and Bichon Frise. Food corner: I have learnt to make some Indian dishes. I love butter chicken and biriyani. I am learning how to make them. When I am in Chennai, I get the recipes, go back home and teach my mother. I love coconut in all my food. a�� I is scheduled to release on January 15.